The Maddux Deep Seating Collection offers mix-and-match capabiltiies with sectional couch, swivel rocker, spring chair and club chair components available. Oh, and don't forget that cozy firepit for cool autumn nights! 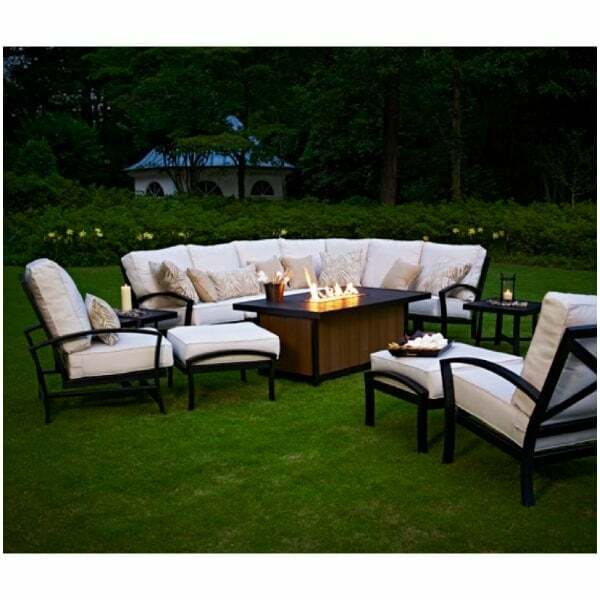 The featured set includes a larger sectional built with multiple units, including central sunits, a corner unit, a right arm end unit and a left arm end unit. A faux wood firepit centralizes the backyard action and two chairs with ottoman pairings serve as feet up, head back, all-night-long style seating. As for construction, Meadowcraft utilizes exceptionally sturdy iron alloy which is hand wrought by master craftsmen. Customize the Maddux Deep Seating Collection with one of Meadowcraft’s four premium finishes and your choice of an attractive selection of designer fabrics. Finishes: Charcoal, Chocolate, Bronze, and Canyon Spice. Finish You choose. Please call!